Presenting solid, reliable strategies based on author Michael Masterson's own successful practices, and debunking some common illusions entrepreneurs have about their businesses, the book is a vital resource for anyone looking to avoid the pitfalls that threaten fledgling companies. MICHAEL MASTERSON is not your typical businessman. An ex–Peace Corps volunteer, he never took a class in business, doesn't read the business press, and hates to talk business. He spends his spare time writing poetry, collecting fine art, and practicing Brazilian Jiu Jitsu. His neighbors call him a bohemian. But he's also an entrepreneur. He started his first business when he was eleven years old, and in the forty-five years that have elapsed since then, he has started or co-started dozens of successful businesses. The author of numerous business books, several of them New York Times and Wall Street Journal bestsellers, Masterson consults for private clients and writes the Palm Beach Letter, a newsletter for individual investors. Successful entrepreneurs quit their jobs, throw caution to the wind, and invest every last cent on following some crazy dream . . . right? Wrong. Many of the world's most profitable self-starters, from Bill Gates to Jeff Bezos, took their time setting up their revolutionary companies, weighing the risks, hedging their bets, and proceeding with trepidation. If you're sold on the idea of building your own business but are daunted by the potential pitfalls, The Reluctant Entrepreneur: Turning Dreams into Profits is for you, covering everything you need to know to successfully balance the thrill of going it alone with the fear of getting in too deep. A comprehensive, step-by-step guide for would-be entrepreneurs keen to strike out on their own but wary of the dangers, the book presents a road map for maximizing success while minimizing risk. Focusing on overcoming the anxieties that prevent many budding business owners from ever fulfilling their potential, author and entrepreneur extraordinaire Michael Masterson explains exactly how to launch and develop a startup during the two most difficult phases of growth: from nothing to $1 million and from $1 million to $10 million. With coverage of everything from coming up with a good idea to figuring out—and finding—the people you want to work with, the book offers an all-encompassing look at how to build a business from the ground up, whether you've got a great concept in mind or are just looking for a new way to bring in a little extra cash. 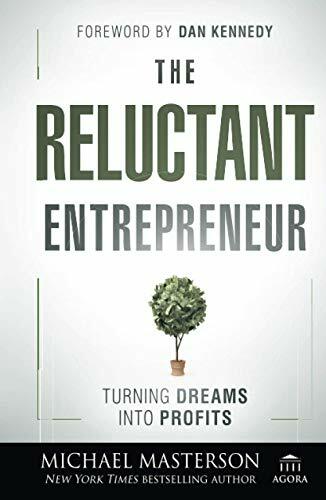 Filled with reliable strategies drawn from Masterson's own incredibly profitable career, The Reluctant Entrepreneur breaks down each part of the entrepreneurial process into a series of easy-to-follow steps, giving you the tools and advice you need to meet every challenge. The essential guide for cautious individuals interested in entrepreneurship but wary of the risks, the book addresses the fears and misconceptions that are standing in your way, walking you through the necessary decisions you need to make before you even think about developing a business plan or talking with a bank. Written by a man who's made his fortune following the lessons laid out in these pages, this may well be the only book you need to start—and succeed—as a reluctant entrepreneur.